Bass pro Gary Klein will be fishing his 28th Bassmaster Classic and 3rd Classic on the Louisiana Delta this February 18 through 20th, the most of any angler in the 2011 event. Photo Credit: B.A.S.S. 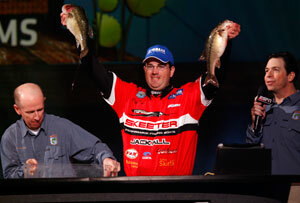 Gary Klein tells the story of cutting a crab trap off his prop during a Bassmaster tournament on the Louisiana Delta. That’s one example of the kind of challenge that makes the delta the perfect fishery for the world championship of bass fishing, the 2011 Bassmaster Classic out of New Orleans, Feb. 18-20. While challenging on many fronts, the delta promises good catches, and the bass population is as healthy as he’s seen, Klein said. “It’s a fantastic fishery. It’s got a lot of fish in it, and I always enjoy fishing it,” he said. Klein has 28 Classics under his belt, more than any other of the 50 qualifiers for the 2011 edition. He’s faced the delta twice in a Classic. In 1999, he finished fourth. In 2003, he was runner-up to his fellow Bassmaster Elite Series pro, Michael Iaconelli. He’s hoping this will be the year for his Classic victory. Professional angler Cliff Pace, shown here with 2 nice largemouth bass, is one of the local favorites for the 2011 Bassmaster Classic on the Louisiana Delta. Photo Credit: B.A.S.S. But, if he had to pick one angler to win (other than himself), he’d pick Cliff Pace. Klein volunteered the information; the veteran is well aware of the value of knowing one’s competition. Pace, who lives not far from the delta — in Petal, Miss., to be exact — chuckled when he heard what Klein said. “I hope I know it as well as everybody thinks I do,” said Pace, who is going into his fourth Classic, but first on the delta. “I have spent a lot of time there. Parts of the delta I consider home water. I grew up fishing tournaments there. It’s where I cut my teeth. Pace, like Klein, put in scouting time before the off-limits kicked in Dec. 13. One big difference between all previous delta Classics, which were in the summertime, is the availability of bass-holding grass, he said. Another difference is spawning stage, he said. The bass may be in prespawn by Classic time. Whatever the conditions, Pace said he’s hoping they’ll turn tough so he can work his advantage of experience. That means he has more Plan B’s than most others have. 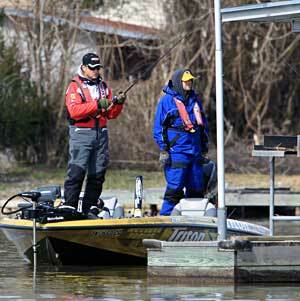 “If things get a little ‘bumpy,’ I’ll know what areas to try to fish and what areas to leave alone. Not wasting your time is about all you can expect from experience on any body of water,” he said. Delta Classic veterans who haven’t navigated the delta since Hurricane Katrina might have trouble, he said. Through its industry-leading publications — Bassmaster Magazine and B.A.S.S. Times — comprehensive website Bassmaster.com, and ESPN2 television programming, Bassmaster provides rich, leading-edge content true to the lifestyle.